This article is about the river. For other uses, see Kafue (disambiguation). The Kafue River is the longest river lying wholly within Zambia at about 1,600 kilometres (990 mi) long. Its water is used for irrigation and for hydroelectric power. It is the largest tributary of the Zambezi, and of Zambia's principal rivers, it is the most central and the most urban. More than 50% of Zambia's population live in the Kafue River Basin and of these around 65% are urban. 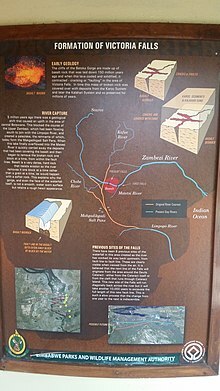 The Kafue River rises at an elevation of 1350 m on the relatively flat plateau just south the border of Zambia and the Democratic Republic of the Congo, 120 km north-west of Chingola in the Copperbelt Province. The source of the Kafue River is in the North-western Province of Zambia. The area is Miombo woodland on the Congo-Zambezi watershed, with many branching dambos lying 10 to 20 m lower than the highest ground, producing a very gently undulating topography. The river starts as a trickle from the marshy dambos (the Munyanshi Swamp is a tributary) and with little slope to speed up river flow, it meanders south-eastwards sluggishly and within 50 km has the character of a mature river. The area receives about 1200 mm rain in the rainy season, and the river's channel soon reaches 100 m wide with a floodplain of fluvial dambos 1–2 km wide. The first road bridge across the Kafue was originally built across the Thames in London during the Second World Way. After the war, it was dismantled and installed some 9km downstream from the railway bridge. Previously, road traffic crossed the river by pontoon. There is also a road bridge across the Kafue on the road between Lusaka and Mongu. ^ a b Kambole, Micheal (2003). "Managing the water quality of the Kafue River" (PDF). Physics and Chemistry of the Earth. 28: 1105–1109. ^ The International Bank for Reconstruction and Development/The World Bank (2010). The Zambezi River Basin A Multi-Sector Investment Opportunities Analysis (PDF) (Report). ^ a b c d American Association for the Advancement of Science website: H N. Weza Chabwela & Wanga Mumba, “Integrating Water Conservation and Population Strategies on the Kafue Flats”, Report of a Workshop on Water and Population Dynamics, Montreal, Canada, October 1996. ^ a b c d e Google Earth accessed 1 March 2007. ^ a b c d Camerapix: "Spectrum Guide to Zambia." Camerapix International Publishing, Nairobi, 1996. ^ Visit Zambia website: "Kafue Province Campaigners consider suing KCM, Zambian Government over Kafue River Pollution." Accessed 1 March 2007. ^ Blacksmith Institute website: Zambia Country Report (April 2002) accessed 1 March 2007. ^ United, Nations. "Innovations for Sustainable Development: Local case studies from Africa" (PDF). United Nations. Retrieved 7 November 2011. ^ "Global Dimensions of Change in River Basins: Threats Linkages and Adaptation" (PDF). Global Systems Water Project. Retrieved 7 November 2011.